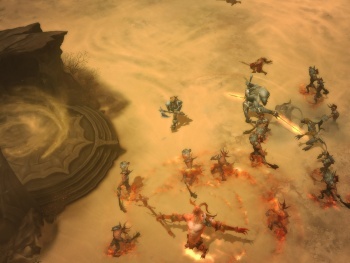 Blizzard says Diablo III is of "similar" size to Diablo II, but with most of its predecessor's nagging issues fixed. If you've been wondering what size of beast Diablo III will be when it's eventually released, you can look back to the size of Diablo II as a guide. Jay Wilson, Game Director for Diablo III, has told IGN that the sizes of the games will be about even. "Honestly it's similar size to Diablo II," he said. "There are some differences here and there, exterior environments are a little more diverse, dungeons are about the same." Further, he revealed that Diablo III's acts (story segments) will also get longer towards the middle and shorten at the end, because Blizzard liked this in Diablo II and felt it gave the feeling of "accelerating towards the finale." Don't fret. Diablo II is a huge game. People are still playing it today. Someone is playing it right now. You're playing it right now, aren't you? Wilson also talked about some of the similarities in gameplay, and how Blizzard plans to fix things that just didn't work. There will still be Hell and Nightmare difficulties, as expected, with randomly generated dungeons, as expected. Exteriors have non-random layouts but random distribution of events and monsters. As for quests, Wilson says: "It's a very linear quest line. We actually tried a much denser, more complex quest system and we found that players who played Diablo games just didn't really want that ... They wanted to stay focused on killing monsters." Because of this, Blizzard implemented side-quests that were more optional. Wilson confirmed that the new skill system in Diablo III will be shown off at BlizzCon 2010. Despite it looking "a lot different," he says: "It's actually functionally not that different from the Diablo II system. It's got some key differences but in terms of the choices that it has the player make it's actually very similar." The best thing Wilson revealed about skills is how they won't allow for a broken character, like he admits you could technically have in Diablo II. "The Diablo II system forces you to get a bunch of skills you don't want and makes the door completely open ... and as a result your player is very likely to end up being broken," he said. "What we wanted to make sure was that that didn't happen." The issue he points out is my biggest problem with Diablo and other similar games that don't let you re-specialize. When you don't know what the end-game is like, you at least shouldn't be trapped into the decisions made while learning. Glad to see we won't face this in Diablo III, and that it should provide just as much gameplay, if not more, than Diablo II.